(the equivalent of a national scale “uaAA+”). The ratings have been confirmed on the basis of the analysis of the company’s activity in the half-year 2014. The ratings have been confirmed on the basis of the analysis of the company’s activity in the first quarter 2014. 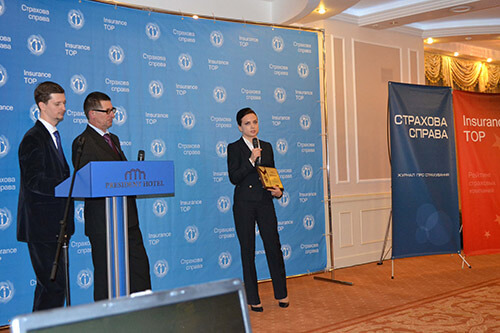 The annual presentation of year 2013 results of the insurance market of Ukraine and the solemn Ceremony of awarding the Leaders’ Award was held by Insurance TOP magazine on 15 April 2014. Top-managers of the leading insurance companies, banks, brokers, as well as representatives of the government and foreign embassies took part in the event. 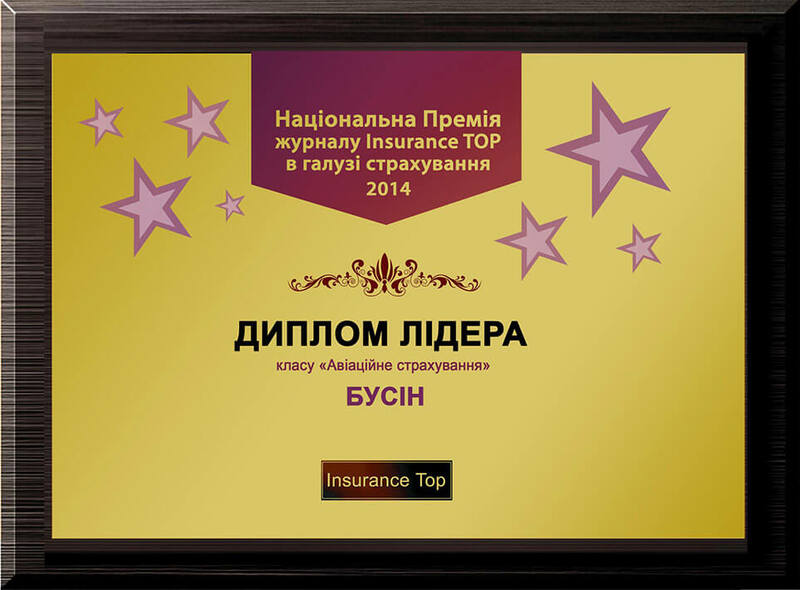 According to the Insurance TOP magazine in 2013, BUSIN Insurance Company is recognized as the Leader of the National Award ” AVIATION INSURANCE”. «For several years we have been able to thank you for your high recognition of our work. BUSIN has existed almost as long as independent Ukraine. For more than 20 years we have been building our connections with the international insurance market. Despite today’s challenging conditions my colleagues in BUSIN and I continue to believe that consistency, transparency and trust confirmed over the length of time we have been working with our Clients and reinsurance Partners is indestructible concept, untouched by time and circumstance. I would like to wish everyone of us continued success in the professional endeavors», – said Executive Director of BUSIN Ins. Co. Irina Morozova on receiving the Award. (the equivalent of a national scale “uaAA”). The ratings have been confirmed on the basis of the analysis of the company’s activity in 2013. Such grade of the stability rating means that company is characterized by a very high level of financial stability compared to other insurers. BUSIN celebrates 21st Anniversary of its successful professional activity on the insurance market. Our company has become a strong financial institution and has taken the leading position among the best companies of the insurance business in Ukraine during these two decades. Our impeccable reputation, financial stability and high professionalism are well-known in Ukraine and abroad. We thank our clients and partners for their confidence and constant support and hope for future cooperation! BUSIN significantly expanded the terms and conditions of the obligatory Aviation Reinsurance Treaties within the development strategy adopted in 2014. Some geographical limitations were removed and the capacity of the Aircraft Hull All Risks Treaty was increased to 5 million US Dollars including War and Allied Risks. It was done in order to enter new market segments and to adopt to the structural changes after Ukraine’s joining of the Open Sky Treaty. These changes were agreed thanks to our long-term cooperation with the leading foreign reinsurance companies and brokers and due to the impeccable reputation of BUSIN on the international insurance market. BUSIN has the Aircraft Third Party, Passenger, Passenger Baggage and Cargo Legal Liability Treaty largest in the history of the Ukrainian insurance market with limits of coverage equal to 850 million US Dollars (including War and Allied Risks) and Aircraft Hull All Risks Treaty for 5 million US Dollars (including War and Allied Risks). Lloyd’s syndicate is the leader of these Treaties. International reinsurance companies with financial stability ratings of А-/А /А+ are involved in our reinsurance programs. The obligatory program covers retrocession risks. This guarantees effective consideration of our reinsurance partners’ proposals and reliable reinsurance coverage. The rating agency Expert Rating confirmed the stability rating of BUSIN insurance company on its own scale on the grade of “A” (the equivalent of a national scale “uaAA”). Such grade of the stability rating means that company is characterized by a very high level of financial stability compared to other insurers. BUSIN held Bankers’ Club meeting addressing the topic “Stability of the financial sector of Ukraine”. The meeting attended representatives of leading Ukrainian banks, insurance companies, rating agencies, League of Insurance Companies of Ukraine, International Financial Corporation (IFC) and Institute of the Economy and Prediction of National Academy of Ukraine. During the meeting spokesmen of BUSIN presented analytical data about stability of Ukrainian banking system and insurance market. Members of the Club took an active part in the discussion focused current issues in banks and insurance companies security ratings and a future development of their cooperation. Leading specialists of BUSIN financial department had completed the qualification improvement course and exchanged experience with their colleagues on International Financial Reporting Standards (IFRS) for insurance companies in Ernst&Young Business Academy in Moscow. This topic is of an increasing importance now due to transfer of all Ukrainian insurance companies to IFRS since the beginning of the current year. The annual presentation of year 2012 results of the insurance market of Ukraine and the solemn Ceremony of awarding the Leaders was held by Insurance TOP magazine on 28 March 2013. Top managers of the largest insurance companies, brokers, banks, investment companies, leaders of professional associations, government officials and representatives of foreign embassies took part in the Ceremony. According to the Insurance TOP magazine in 2012 year, BUSIN Insurance Company is recognized as the Leader of the National Prize “AVIATION INSURANCE”. Basing on the analysis of financial data for 2012 year by Insurance TOP Magazine BUSIN Company ranks the first place among TOP 25 Aviation Insurers in the insurance market of Ukraine. Recognizing the significant achievements of the company over two decades Chairman of the Board Dennis Ovchinnikov and Executive Director Irina Morozova were also awarded by the Honorary Diploma of the National Award “20 Years of the Stability in Aviation Insurance Market”. The rating committee of RA «Expert-Rating» has decided to improve the financial stability rating of BUSIN up to the level “A” according to the international scale of the Agency, the insurer’s rating remains unchanged according to the national scale. The Agency has made this decision based on the study of preliminary data of BUSIN in the 12 months of 2012. In the «Expert-Rating» Agency’s opinion, the 2012 year has become a turning point for the company and has decreased its dependence on the domestic insurance market in Ukraine. The financial state of company increasingly depends on the events in the market of international air transportations and loses the correlation with the national market. In this situation the parity between the assessment of the financial stability rating of the insurer according to the national and international scale must be changed. In December 2012 Aviation Reinsurance Treaties were renewed on the international market via a broker Lloyd’s, with the participation of the Lloyd’s syndicates and leading reinsurance companies with the highest financial stability rating. BUSIN Ins. Co. raised the limit of cover under Aircraft Third Party, Passenger, Passenger Baggage and Cargo Legal Liability Treaty up to 850 million US Dollars including war risks coverage up to the full limit of liability. The rating agency Expert Rating confirmed the stability rating of BUSIN insurance company on its own scale on the grade of AA (the equivalent of a national scale – uaAA). Stability rating of the insurer on the international scale is BBB (good stability rating). Such grade stability rating means that company has very high probability to resist impact of negative factors. BUSIN Ins. Co. in the shortest terms has paid indemnities for aircraft hull of the helicopter Ka-32T crashed in Romania on April 26, 2012. The indemnity paid on the amount of 1 million US Dollars. The investigation is being carried out by the company Air Claims (CIS). Ukrainian Insurers and Insurance companies from Great Britain took part in the payment of the insurance indemnities on this accident. BUSIN Insurance Company thanks to their partners for the proper execution of their duties according to the reinsurance treaties. The annual presentation of year 2011 results of the insurance market of Ukraine and the solemn Ceremony of awarding the Leaders’ Award was held by Insurance TOP magazine in President-hotel “Kiev” on 29 March 2012. 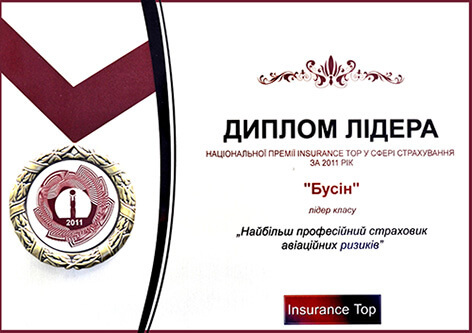 According to the Insurance TOP magazine in 2011, BUSIN Insurance Company is recognized as the Leader of the National Award “THE MOST PROFESSIONAL INSURER OF AVIATION RISKS” and Leader of the Insurance TOP Class “AVIATION HULL”. «We are grateful for the high appreciation of our work. For our company this year is a significant as we are approaching the 20-year milestone of our work on the insurance market of Ukraine. And, of course, success wouldn’t be possible without our team of professionals which remained unchanged for over 10 years. Ukraine is the aviation country. Despite all the difficulties we believe in its potential. We are optimistic about the future of our company. We actively develop our business and provide reliable insurance coverage for all our Clients”, – said Executive Director of BUSIN Ins. Co. Irina Morozova on accepting an honorary Award. The Annual Meeting of Shareholders was held on March, 19. Financial results of the year 2011 were discussed during the Meeting. The Meeting approved increasing the amount of Authorized Capital from UAH 24 400 thousand to UAH 38 000 thousand and Guarantee Fund from UAH 4 125 thousand to UAH 9 500 thousand. Power of Mr. Ovchinnikov Dennis as the Chairman of the Board was extended for 3 years. As at January, 1 2012 the company’s assets amounted UAH 92 612 thousand. The amount of gross premiums has increased in 2011 by 7% and amounted UAH 78 731 thousand. The total amount of claims paid is UAH 1 513 thousand. Taxes and duties were paid on the amount of more than UAH 4 880 thousand. BUSIN remains leader in aviation risks insurance in Ukraine and focuses on the diversification of the company insurance portfolio. International audit of the year 2011 activity was performed by BDO LLC according to International Financial Reporting Standards (IFRS). With the support of the Ministry of Education, Youth and Sports of Ukraine, State Tax Service of Ukraine on the basis of the National University of the State Tax Service of Ukraine V All-Ukrainian student’s Olympiad on the subject “Insurance” was held in Irpin town on March 1-3, 2012. The 50 best students of Universities from all regions of Ukraine took part in this competition. Participants of the Olympiad decided on theoretical tasks of insurance and practical case studies. Their results were evaluated by a competent Jury. Understanding the need to develop human resources for insurance market and to increase positive public perception of insurance BUSIN assisted in organizing and sponsored this event and plans to do such sponsorship in future. February 16, 2012 RA «Standard-Rating» announces about assigning the financial stability rating of BUSIN Insurance company at the level uaAA+ according to the national scale. According to the Rating Agency report, the insurer relates to one of the oldest companies in Ukraine, with work experience of 19 years in the Ukrainian market. The company successfully survived the system crisis of 90-th, the financial crisis of 2008-2009, at the same time BUSIN succeeds in maintaining a significant market share in aircraft insurance. BUSIN has improved the level of client diversification for the 9 months of 2011. So, in the first 9 months of 2011 the 10 largest clients of IC “BUSIN” accounted for 47,32%, in the same period of 2010 they accounted for 60,54%. During the reporting period the interest bearing assets exceeded the indemnities in 23 times. The Agency’s analysis shows that BUSIN conducted the conservative policy of providing future indemnities. Liquid assets covered the indemnities in dozens of times during the whole Company’s history that guaranteed the prompt fulfillment of the insurer’s liabilities to the insurants. Besides, according to the Agency’s assessments BUSIN adhere to the conservative financial policy of the insurer in capital management. BUSIN renewed the largest in the history of the Ukrainian insurance market Aircraft Third Party, Passenger, Passenger Baggage and Cargo Legal Liability Treaty with the increased limits of coverage equal to 750 million US Dollars (including War and Allied Risks). Aircraft Hull All Risks Treaty is also renewed for 3 million US Dollars. World leaders of the International reinsurance Market and Lloyd’s syndicates are involved in Treaties. 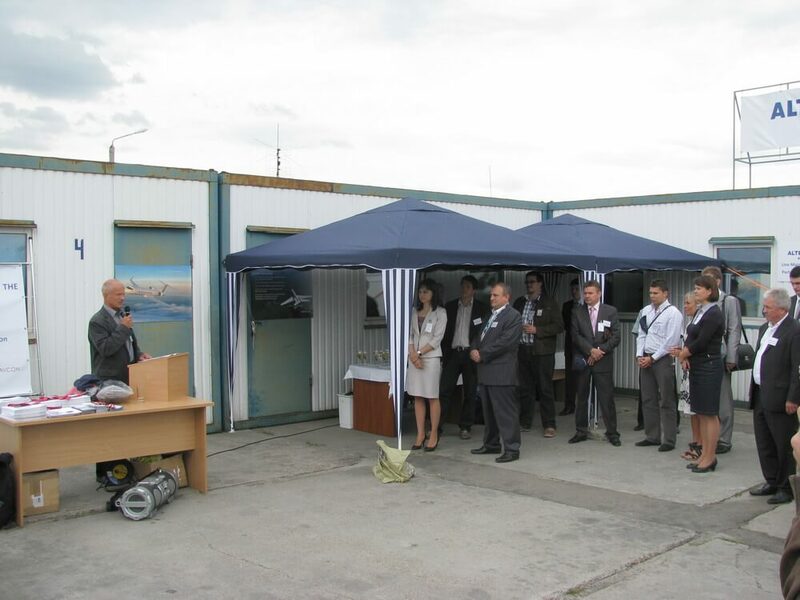 Official opening of the Gulfstream Line Maintenance Station was held at Kyiv International Airport Boryspil on Thursday, 08 September 2011. This project is a joint initiative Airlines “Aero-Charter” and Altenrhein Aviation (Switzerland). At the official opening ceremony were representatives of companies and project partners – Gulfstream Corporation, AvconJet, BUSIN Insurance company and so on. 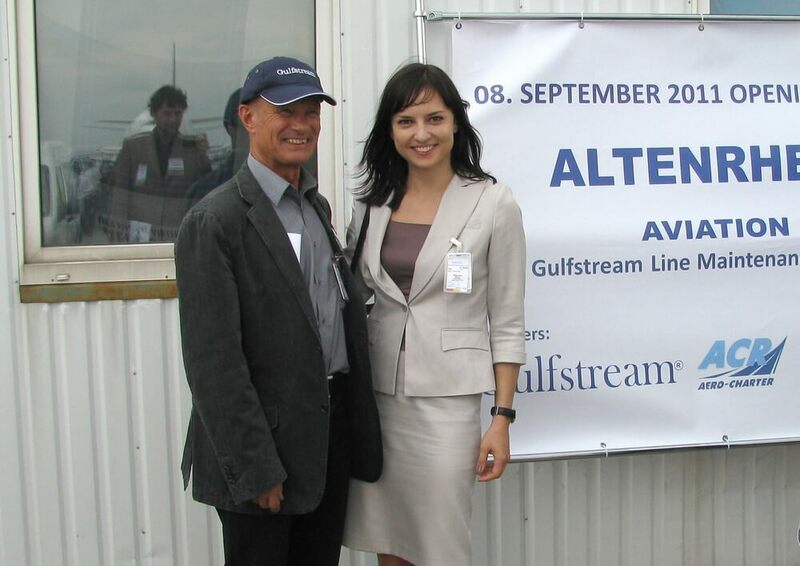 CEO of Altenrhein Aviation Friedrich Gothsche solemnly thanked the team of BUSIN Insurance company for their work to develop and implement a comprehensive program of insurance coverage for the Gulfstream aircraft Line Maintenance Station and expressed hope for mutually beneficial cooperation. In turn, the Executive Director of BUSIN Insurance company Irina Morozova said that the company is proud of our participation in such international project and always tries to justify the trust of Clients, providing insurance services on the high level of international standards. Recognizing professional and scientific achievements, as well as personal leadership, Head of Supervisory Board Mrs. Nepochatova Larisa (PhD) officially accepted into the ranks of the International Aviation Womens Association (IAWA). The decision was taken recently by the Board of Directors of IAWA. International Aviation Women’s Association is an international organization, which since 1988 brings together the most successful and famous women in the aviation industry. Organization has united representatives of state bodies, top management of airlines, airports, insurance and legal companies, financial institutions and media from around the world. The main Mission is to support and develop women in the industry. To this end, the organization continually provides educational grants to women who are trained at Universities of Civil Aviation, holds international conferences, monitors working conditions of women and provides them with informational support. The sponsors of the Association are the Boeing Company, AON Corporation, Emirates, United Airlines, Willis, Airline Weekly and other leading organizations and companies of aviation industry. THE SECOND WILLIS RUSSIA/CIS AVIATION INSURANCE CONFERENCE was held by Willis insurance broker in five-star Premier Palace Hotel (Kyiv) on May24-26, 2011. The representative Forum brought together nearly 150 participants from different countries – Great Britain, Germany, Ukraine and Russia. In particular, the event was attended by representatives from such companies as Willis, CATLIN, ATRIUM, Chaucer, Chartis Insurance UK, Global Aerospace, Allianz, Munich Re, Inter Hannover, AIRCLAIMS, Beaumont & Son. The conference participants discussed the current issues, problems and prospects of the aviation insurance market of Ukraine and the CIS. Different Reports were made by the top managers of insurers, brokers, air carriers, industry experts, lawyers and leading aviation underwriters. Head of the Board of Directors of BUSIN insurance company Nepochatova Larisa (PhD) made the English-language Report “Review of Ukrainian Insurance Market and Aviation Insurance Aspects”. Participants of THE SECOND WILLIS RUSSIA/CIS AVIATION INSURANCE CONFERENCE highly appreciated the level of organization and expressed confidence that such forums promote the international integration of the Ukrainian insurance market. The Event was sponsored by Clyde & Co, ATRIUM, CATLIN, Allianz, GATES and PARTNERS, AIRCLAIMS, BUSIN Insurance company. BUSIN ranked 12 place in the Group leaders of the (Pi)-stability rating of Ukrainian insurance companies annually held by RA Expert Rating. 51 insurers participated in rating which totally collected more than 7 billion UAH premiums in year 2010. The majority of insurers that formed Group leaders are companies with foreign capital. Ranking Results were published in the official publication of the State Commission for Regulation of Financial Services Markets of Ukraine “Ukraine Business Review» (No. 17 dtd 26.04.2011). The confirmation BUSIN’s of stability rating to uaAA grade on national scale (equivalent to the international scale – BBB). The rating agency Expert Rating in the first quarter of 2010 confirmed the stability rating of BUSIN insurance company on its own scale on the grade of AA (the equivalent of a national scale – uaAA). Stability rating of the insurer on the international scale is BBB (good stability rating). Such grade stability rating means that company has very high probability to resist impact of negative factors. First BUSIN JSIC was rated the stability rating of national scale uaA+ in 2007, and in March 2009 the company’s rating was increased to uaAA. Over the past five years international audit annually performed by BDO LLC according to International Financial Reporting Standards (IFRS). This year the rating agency Expert Rating put into practice the international rating scale and BUSIN JSIC was rated on a high level BBB on the international scale. In the first quarter of 2010 BUSIN JSIC continued to increase its market share. Compared with the premiums received for the first quarter of 2009, gross premiums for the same period in 2010 increase by 5,88%, in comparison with the first quarter of 2008 – by 45.04%. The company continues to demonstrate significant growth dynamics during the period of financial crisis. BUSIN Insurance Company thanks to their domestic partners for the timely and proper execution of their duties according to the reinsurance treaties. Our long-term reliable partners such as PZU Ukraine, Omega, ASKA, TAS, UTICO, Kremen have paid in full despite the economic crisis their shares of indemnities for aircraft hull of the helicopter Ka-32T crashed in Turkey on June 18, 2009. This loss payment is an example of insurers’ international integration from different countries in the settlement of large losses (as some part of the risk was reinsured according to the treaties on Lloyd’s market). That is why the perfect execution of Ukrainian insurers’ duties is the best evidence of their solvency and financial stability for the international insurance market. The top management of BUSIN JSIC took part in the Annual General Meeting of International Union of Aviation Insurers (IUAI). The 75th Anniversary Annual General Meeting of International Union of Aviation Insurers (IUAI) was held in Beijing (China) at the beginning of June. BUSIN JSIC’s Chairman of the Board, Mrs. Larisa Nepochatova and Executive Director, Mr. Dennis Ovchinnikov took part in the Meeting. The authoritative representatives of insurance companies from 25 countries discussed the following current aspects of aviation insurance: volume and prospects of the aviation insurance market development, insurance and claims management in time of global economic crisis. Those participating in the conference were presented to reports from IUAI’s top managers, experts, lawyers and leading aviation underwriters regarding this topic as well as the range of corresponding decisions were adopted. IUAI (International Union of Aviation Insurers) was founded in 1934 in London with the purpose of coordination of the interests of International Aviation and Space Insurance markets’ members. IUAI closely collaborates with International Air Transport Association (IATA), Joint Aviation Authorities (JAA), International Civil Aviation Organization (ICAO), representatives of aviation authorities, supervision departments on insurance activity. BUSIN JSIC is the member of IUAI since year 2003. The increasing of stability rating to BUSIN JSIC. Expert Rating RA increased stability rating to BUSIN JSIC to “аa” grade (“uaAA” grade on national scale). Such grade stability rating means that company has very high probability to resist impact of negative factors. The amount of gross premiums has increased in 2008 by 31,28%. and amounted UAH 53 million. At the same time the reinsurers’ share in total premiums has decreased from 77% in 2007 to 74,5% in 2008. In year 2008 the amount of made net income exceeded the similar indicator 7,77 times in 2007 and reached UAH 18 million, return on equity amounted 40,22%. BUSIN JSIC summed up results of the year 2008. BUSIN JSIC held its Annual Meeting of Shareholders on February, 20. Financial results of the year 2008, new directions of the company’s development were discussed. As at January, 1 2009 the company’s assets amounted UAH 72 386 thousand. Liquid structure of assets confirms solvency and availability to meet commitments in time of financial crisis (53% of company’s assets are currency or equivalent). BUSIN JSIC remains leader in aviation risks insurance in Ukraine (80 % of the company insurance portfolio). Development strategy for the year 2008 was focused on the diversification of the company insurance portfolio and almost 20% of BUSIN’s insurance services were provided in field of motor, property and financial insurance as well as in liability insurance within company’s work in Ukrainian Nuclear Insurance Pool (UNIP). The total amount of claims paid in the year 2008 is UAH 2 617 thousand including UAH 1 124 thousand paid for the propellers’ damage of helicopter Ka-32T. The company’s net profit after the result of the year 2008 amounted UAH 18 641 thousand. Taxes and duties were paid on the amount of more than UAH 7 800 thousand. International audit of the year 2008 activity was performed by BDO Balance Audit according to International Financial Reporting Standards (IFRS). The confirmation of rating assessment of BUSIN JSIC. The amount of gross premiums has increased in 2007 by 30.2%. and amounted UAH 32 million. The increase of gross premiums in 2007 considerably outruns market average rate thus indicating steady growth of company’s share in Ukrainian market. BUSIN JSIC remains leader in aviation risks insurance in Ukraine. Expert-Rating positively estimates the considerable growth of gross premiums, ROE and amount of net income. The base indices of Сompany’s solvency and liquidity remain in the requirement limits and the Company’s pass through the international audit denotes a high quality of cost accounting. BUSIN JSIC celebrates its 15th anniversary. We thank our shareholders, clients and partners for their confidence, constant support, and look for beneficial cooperation in the future! Celebration party dedicated to 15th anniversary of BUSIN JSIC will take on February, 22 at Grand Hall “Sofiyevskiy” Premier Palace Hotel. BUSIN JSIC summed up results of the year 2007. BUSIN JSIC held its Annual Meeting of Shareholders on February, 15. Financial results of the year 2007, new challenges and directions of the company’s development were discussed. The Meeting approved increasing the amount of Authorized Capital on UAH 14,275 million and Guarantee Fund on UAH 4,0 million. Development strategy for the year 2008 remains the same: focusing on insurance of large and technical risks of corporate clients, further structure diversification and development of the company insurance portfolio, considerably increasing of company capital and income from investment activity. L. Nepochatova, BUSIN JSIC Сhairman of the Board entered the Final of Entrepreneur Of The Year 2007 Award held by Ernst & Young. Finalists at World Entrepreneur Of The Year (EOY) are assessed by an independent panel of judges according to the following set of criteria: entrepreneurial spirit, financial performance, strategic direction, global impact, innovation, personal integrity and influence. BUSIN Сhairman of the Board became the only representative of Non-life insurance companies in the Final of National Entrepreneur Of The Year 2007 Award. Ernst & Young presents its annual Entrepreneur Of The Year award to the most successful and innovative entrepreneurial business leaders around the globe in more than 135 cities in 50 countries worldwide. The EOY award recognizes the global impact of entrepreneurs and the positive impact they have on their local communities and countries. Ukrainian Nuclear Insurance Pool (UNIP) made a positive decision by the majority of votes at its general meeting on the 30th November 2007 and affiliated BUSIN JSIC as a member. BUSIN JSIC strictly met all the requirements for members of UNIP and hopes that our business experience will be useful for this union of Insurers. The international audit of BUSIN’s financial statistics for the period of three years was conducted by BDO-Balance Audit company in full accordance with International Financial Reporting Standards (IFRS). According to the audit results companies’ assets as at December 31, 2006 reached UAH 73,27 million, total premiums amounted – UAH 41,00 million, net profit after taxation was UAH 4,43 million. BUSIN JSIC entered the British Business Club in Ukraine (BBCU). Many years of our effective cooperation with London insurance market and insurance companies from Great Britain is the best example of business cooperation between Ukraine & UK. For the purpose of further business development and establishing new contacts we plan to take active part in BBCU business and social networking events such as seminars, presentation, exhibition, conferences, delegation and trade events. The British Business Club in Ukraine began operations in 2006 to help bring together the British and the Ukrainian business communities. The members of BBCU are successful business owners and managers from all industries from both the UK and Ukraine. The mission of the BBCU is to facilitate contacts and business opportunities for British and Ukrainian businesses, organisations and individuals. BBCU helps it’s members with finding potential partners, provides business information and compiles reports on request. BUSIN JSIC and Effect Assets Management Company have signed an agreement on insurance assets management. Cooperation under the agreement provides management of the part of BUSIN JSIC assets by Effect Assets Management Company; it will allow effective use of insurance reserves and will give BUSIN JSIC a competitive advantage in the market. Nepochatova Larysa M., BUSIN JSIC Head of Board of Directors: “In international practice the level of investment profitability is one of the most important factors for evaluation of the insurance company’s reliability, and that is why BUSIN JSIC pays great attention to the investment factor of the company’s profits. To increase the effectiveness of our stock market operations we transferred part of our assets to be managed by this professional company”. L. Nepochatova, BUSIN JSIC Сhairman of the Board, was officially acknowledged by WHO’S WHO International Historical Society (Washington, USA) for professional achievements and charisma WHO’S WHO International Historical Society is an international organisation, which has united the most successful and famous leaders of all continents since 1928. Larysa Nepochatova, President of BUSIN JSIC and Ivan Ovchynnikov, Head of Reinsurance Department gave a presentation of the risk-management programme for one of the leading companies of the Ukrainian air transportation market – AEROSVIT Airlines. The practical experience of the world-leading airlines and implementing of the risk management system implementation were discussed during the presentation and this risk management system can be used by any airlines. Larysa Nepochatova, President of BUSIN JSIC was awarded a “Leaders Guard” Diploma from Ukrainian Rating Program for personal contribution to the development of the company and development of Ukraine’s managerial system. On 5th September, 2006 there was a meeting of the Bankers Club, The potential problems of banking and insurance cooperation were discussed. BUSIN JSIC organised the meeting. Advantages and disadvantages of the most popular models for cooperation of banks and insurance companies were considered during the meeting. It was decided that existing models of cooperation do not satisfy both parties. That is why BUSIN JSIC offered an alternative model of cooperation, which takes into account specific features and level of development of the Ukrainian insurance and banking markets. The opportunity of using of insurance for banks risks limitation in mortgage lending was also considered, as it makes mortgage lending more affordable for the general public. Larysa Nepochatova, President of BUSIN JSIC considers that the mutual interest of bankers and insurers in extension and expansion of their cooperation is a basis for successful cooperation of these two financial establishments, and development of long-term relations. BUSIN JSIC was included into the “Gvardiya 500” rating of the largest companies of Ukraine carried out by the Ukrainian rating Agency and “Halytski Kontrakty” Publishing House, and it received a Certificate for the right to use the “Gv. 500” trade mark. Financial statistics in 2005 BUSIN JSIC was top of the Insurance Indemnity National Club’s rating in the “Aviation Insurance” Category. In 2005 the company paid insurance indemnities of over 1.7 million US Dollars. Insurance Indemnity National Club is an independent club founded in 2001 by “Right and Economic Research” Ukrainian Scientific and Research Institute, “Insurance Business” magazine editors and “Insurance Top” Insurance rating. The Club unites companies which paid insurance indemnities exceeding € 1.7 million per year and participated in “Insurance Top” project. BUSIN JSIC has been a valued member of the Insurance Indemnity National Club for five years. International IATA Conference on Aviation insurance and risk management will be held in Bangkok, Thailand. BUSIN JSIC’s President, Nepochatova Larysa M., will take part in the Conference. The representatives of international organizations, aviation authorities, airports, leading airlines, insurance and legal companies are planning to discuss the following current aspects of aviation business: volume and prospects of the aviation insurance market development, peculiarities of insurance of military and similar risks under modern circumstances, regulatory policy of the European Union regarding airlines and other issues. Those participating in the conference will listen to reports from airlines’ top managers, and Lloyd’s brokers’ representatives regarding this topic. IATA (International Air Transport Association) was founded in 1945 with the purpose of developing international cooperation in aviation and improve the safety, reliability and economic services of air transportation. Today IATA (Headquarters in Montreal, Canada) unites 265 airlines, which perform more than 94% of the world transport, as well as 82000 travel agencies from all over the world. Larysa Nepochatova, President of BUSIN JSIC took 14th place in “Gvardiya 500” rating of the best insurance company branch leaders in 2005. The list was compiled by the Ukrainian Rating Agency and “Halytski Kontrakty” Publishing House on the basis of insurance companies’ top managers’ evaluation of each other based on the following criteria: personal reputation, leadership potential, flexibility, ability to form corporate culture and use new technologies and management methods. BUSIN Ins. Co. signed Aviation Liability Reinsurance Agreement (Aircraft Third Party Legal Liability/ Passenger Legal Liability / Cargo Legal Liability) a limit of US Dollars 600 million exclusive to Ukrainian market. This Agreement proves the confidence of world-famous Insurance companies and brokers in BUSIN and it’s high standards of integrity in the international insurance market. Inception date of the Agreement – 1st January , 2006. The cover obtained with such Reinsurers as American International Group (AIG), Munich Re, Hannover Re as well as Lloyd’s Syndicates. Aviation Hull Reinsurance Agreement with an agreed maximum aircraft value of US Dollars 3 million came into effect at the same time. All conditions and terms of the Agreement are standard for the aviation insurance market. Ukrainian airlines can now be insured to a higher quality at a lower prices and therefore be more competitive. Ukrainian Rating Agencies and Publishing House “Galytski Kontrakty” have awarded BUSIN with a Diploma for effective branding in 2004. Their positive decision was based on financial success of our company. BUSIN Ins. Co. was named Laureate of the Year 2005 in Aviation Insurance. The National Program Ukrainian Financial Olimp named BUSIN the 2005 Laureate of the Year in Aviation Insurance. BUSIN received this recognition for significant contribution to the development of the Ukrainian Aviation Insurance Market. An in-depth study and audit of the contenders’ financial statistics and services provided were conducted by Advisory committee of Ukrainian Financial Olimp in two stages according to certain approved criteria. Its positive decision was also based on clients’ favorable reviews and company’s excellent reputation. National Program Ukrainian Financial Olimp – special public organisation for the domestic financial market. The program’s founders are the Association of Ukrainian Banks, the League of insurance organisations of Ukraine, the Association of Accountants and Auditors of Ukraine, Kiev National Economic University. We are pleased that our efforts and results are recognised by experts, partners and clients. According to the analysis of insurance companies’ activity approved by the State Commission for Regulation of Financial Services Markets of Ukraine Decree of March 17, 2005 No.3755 financial statistics of JSIC Busin with a high 1.6 level and determined as financially stable. BUSIN Ins. Co. sponsored the Ukrainian national shooting team and provided financial support for training and participation in World Cup competition and in Olympic Games 2004 in Athens. As the result, in Athens the youngest world shooting champion Olena Kostevich won the gold medal in pistol shooting from 10 meters. We sincerely congratulate winner and wish her many sporting successes in future! In order to develop close partnership with the representatives of Lloyds insurance market our company delegates specialists with good theoretical and practical skills in insurance and fluent English to attend trainings and seminars abroad. Almost all top managers have already studied London insurance market and this year our young but experienced specialists Irina Morozova and Sergey Deminsky attended two-week course in London (Great Britain) on the invitation of world-famous authorised Lloyd`s brokers – Willis Overseas Brokers Limited and AON Limited and therefore were awarded with international certificates. Sergey Deminsky, Deputy Financial Director also attended course “Accounting and Financial Aspects of insurance” course covered topics such as: financial accounting, regulatory and supervisory framework in respect of insurance, organisations financial management, solvency of insurance organizations. As a result Sergey was awarded a certificate from the Chartered Insurance Institute (London). With the view to further improving their professional skills, other specialists of Busin Ins. Co. will also take part in such postgraduate courses in the future. Joint-Stock insurance company BUSIN started insurance indemnity payments for an accident with an IL-76 plane from “Azov-Avia” which took place near Baku airport (Azerbaijan) on 04 th March, 2004. Company has already paid the first insurance indemnity of 270’000.00 Ukrainian hryvnas for site clearance. BUSIN will pay insurance an indemnity to the assured as well as insurance compensation to the families of the crew members who lost their lives in the accident and to the cargo’s owner. According to the acting legislation insurance compensation will be paid not only to the families of these crew members but also to the four injured crew members who are disabled now and receive medical treatment. 8 Ukrainian insurers and insurance companies from Russia and Great Britain took part in the payment of the insurance indemnities on this accident. An investigation is being carried out by the company “Air Claims (CIS)”. According to the rating of League of the insurance organizations of Ukraine published in the magazine “Business” (No. 17 (588) from 26.04.2004) in 2003 Busin ranked second among leading Insurers of the Ukrainian insurance market. The level of BUSIN’s claim payments exceed 56% whereas the average figure was 9,4%. BUSIN constantly demonstrates a high level of claim payments. So, in 2002 year BUSIN achieved 38,6% the average market level is 12,2%. Specialists of BUSIN (both post-graduate students of National Aviation University) Irina Morozova and Ivan Ovchinnikov gave a series of lectures on “Insurance” for students of the “Economics and Business” faculty of National Aviation University. BUSIN financed a programme for disabled children to increase the financial resources of “Life-School” – the first “family school” for disabled Ukrainian children. Joint-Stock insurance company BUSIN increased their assets by 4 500 000,00 UAH to 10 125 000,00 UAH. A decision about the issue of 45 000 shares was made at BUSIN’s Annual General Meeting of shareholders that took place on 26 November 2003. The company’s assets were increased by dividend reinvestment. As a part of our annual programme of support BUSIN has sponsored the purchase of the medical equipment for Ternopol oncological clinic. BUSIN sponsors the cultural-art welfare fund “Kyiv-Classic”. The fund’s aim is to revive Ukraine’s sense of charity, culture, art and education as well as awareness of national culture. BUSIN’s activity at the year 2003. The inspection commission report on the results of financial and economic activity. The approval of the procedure of profit distribution. Elections of directors, shareholder committee and inspection commission. Decision-making in respect of the increasing of the stature fund. Changes and additions to the Statute and internal normative documents. Payments of the first insurance indemnities for the Ukrainian Mediterranean Airlines accident, which took place in Turkey on 26th May 26, 2003 were paid. On August 27, 2003 BUSIN paid insurance indemnity for the hull of the plane Yak-42 to the owners – Lebanese company J.T.R. for the sum of 2 million US dollars.10 Ukrainian insurers and more than 20 leading European reinsurers take part in the payment of the insurance indemnities. The insurance investigation was carried out by the company “Air Claims” (Great Britain). The Joint-Stock insurance company BUSIN with the support of legal company “Beaumont and Son” and its solicitors in Spain carry out legal aspects of the payments of the insurance indemnities in the view of the norms of international law. On 29th May 2003, an award ceremony for the winners of the “Insurance Internet of Ukraine, 2003” contest, organised by the League of Insurance Organizations of Ukraine, took place. BUSIN was pronounced the Winner in the category “Business Card”. Executive Committee of IUAI (International Union of Aviation Insurers) made a decision at its meeting on the 3rd February 2003 and affiliated BUSIN as a member. IUAI was founded in 1934 in London. Now IUAI is acting as an International organisation and has 46 members from 30 countries – USA, Great Britain, France, Germany, Switzerland, Japan and other countries. IUAI is the main coordinator of the interests of International Aviation and Space Insurance markets’ members. IUAI closely collaborates with International Air Transport Association (IATA), Joint Aviation Authorities (JAA), International Civil Aviation Organization (ICAO), ECAC, representatives of aviation authorities, supervision departments on insurance activity. This is the first Ukrainian insurer has been made a member og IUAI. The President of JSIC BUSIN said: “The fact that the BUSIN will represent the interests of the Ukrainian aviation insurance market internationally is a significant event for the whole Ukrainian insurance market”. JSIC BUSIN will celebrate its 10th anniversary in the restaurant “Empire” of the hotel “Premier Palace” on the 21st February 2003. The State Department of Aviation Transport of Ukraine (Ukraviatrans) jointly with the JSIC BUSIN gave a practical scientific seminar “Procedures and regulations of the providing obliged insurance of the civil aviation” on the 03rd December 2002 in National Aviation University (Kiev, Ukraine). Filonyuk O.F. (The president of the League of the insurance organisations of Ukraine, Zelenkov V.I. (head of the economic department of the Ukraviatrans), Nepochatova L.M (President of the JSIC BUSIN, PhD), specialists of the leading Ukrainian airlines and insurance companies participated in the seminar. The centre of the training, retraining and informational-analytical provision of the insurance activity jointly with the League of the insurance organisations of Ukraine and the Department of financial organisations and markets of the Ministry of finance of Ukraine, with the help of the JSIC BUSIN carried out the seminar “Procedures and regulations of the providing obliged insurance of the civil aviation” devoted to adopting the Cabinet of the Ministers of Ukraine Decree No. 1535 dtd. 12/10/2002 on the 29th October 2002. The president of JSIC BUSIN addressed the meeting about the main differences between the Cabinet of the Ministers of Ukraine’ Decrees Nos. 1535 and 1083 and about the particular features of the Rules of insurance of the International Insurance Market (Zurich Re 1983). The scientific seminar on the subject “Investigation and prevention of air crash” was held in the Institute of post-graduate on the 29-30 May 2002. The seminar was organised by the State Department of Aviation Transport of Ukraine, the Aviation insurance bureau, with the help of JSIC BUSIN, JSC Avicos, JSIC Narodna. The seminar “Insurance management of airlines and aviation enterprises” organised for the CEO, financial and commercial directors of airlines, economists and specialists performing obligatory aviation insurance, was given in National Aviation University (Kiev, Ukraine) on 3rd – 5th April 2002. The main objective of the seminar was to inform participants about the international standards of aviation insurance, changes to Insurance Law, the addendums and changes to the Decree of the Cabinet of the Ministers of Ukraine No 1083.